Let no one tell you we’ve solved literature’s diversity problem. We remain in a struggle to establish inclusive and egalitarian spaces in lit journals and publishing, at open mics and in university classrooms, during awards ceremonies and reading series. We long for the whole story to be told, to be welcomed, but it is still so lacking. VIDA: Women in Literary Arts tallies the proportion of writing by women (and now, specifically women of color) in “top tier” publications. Stanford University is offering a Coursera class this spring called “Ten Premodern Poems by Women” that unearths work by Phillis Wheatley, Emily Dickinson, and others. Into this atmosphere arrives Maxine Silverman’s Transport of the Aim (Parallel Press, 2013), a collage of poems in the voices of Dickinson, Celia Thaxter, and other poetic contemporaries. The voice of journalist and 19th century abolitionist Thomas Wentworth Higginson, a mentor to Thaxter and pen pal of Dickinson, is also present. Dickinson, as we know, published fewer than 12 poems in her lifetime, though she is one of the most widely taught and well-known American poets (and unfortunately, she’s still often the only woman poet taught in some English classes). Knowing what we know now, it can seem like some sort of miracle that any of Dickinson’s radical and brilliant poetry survived her. Dickinson is also a poet we love to write about, which, I think, speaks to the elusiveness of Dickinson the genius. She was such a recluse, so we are curious about her. Why didn’t she leave her house, we wonder? Did she have romance in her life? Friendship? What about her poems that didn’t survive? What did they say? Higginson’s own interest in Dickinson mirrors that of modern writers and critics. Dickinson spurred a correspondence by writing a letter to Higginson after reading his essay in the Atlantic. Higginson was taken with this very unusual young writer and her almost indecipherable cursive and original ideas. Higginson happened to be a mentor of Celia Thaxter’s as well. 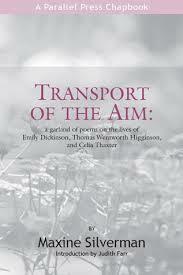 Judith Farr’s introduction in Transport of the Aim notes that Thaxter and Dickinson were not in touch with one another in real life, but in this book, Thaxter does write to Dickinson, but only after Dickinson has died. Farr’s introduction serves as a kind of “family tree” for the book, explaining the collage of relationships between the three main characters as well as the secondary characters—including other contemporary writers such as Walt Whitman and Mark Twain. “Walt Whitman’s Bedside Table” is one of my favorite poems in the book because his voice is so different from almost anything else we see. We learn that Whitman’s table holds a stack of “ten or more” of Dickinson’s posthumous Poems. “Spinster Queen/and Queer,” Whitman reveals something to us through Silverman about another important layer of Dickinson’s work and his own. Celia Thaxter ran an inn (sort of a precursor to the modern artists’ residency) off the coast of Maine. She was one of the few commercially successful women poets of her time, but eventually stopped writing to focus on visual art and her flower garden. The flower gardens in this book signify the rare opportunities of creativity afforded to women historically. “A winter’s worth of eggshells,/ swaddled in sea moss and cotton batting,” the hope that one day everyone will be able to enjoy their creative outlet of choice. The dangerous reality is that we almost never knew about these women writers at all. Silverman reminds us that we must be persistent in studying historical women writers and speculating upon the things they were not able to say. Freesia McKee is a working poet, origami connoisseur, and amateur Scrabble player. Her writings have appeared in the Huffington Post, Verse Wisconsin, Gertrude, Painted Bride Quarterly, Burdock, and other venues. Freesia is also a contributing writer to the PDXX Collective.